Texas topped Oklahoma 75-72 Saturday at the Erwin Center to improve to 3-3 in Big 12 play (Photo courtesy of Texas Sports). Texas took it to OU and showed it can win a crucial, close game against the top teams in the nation. 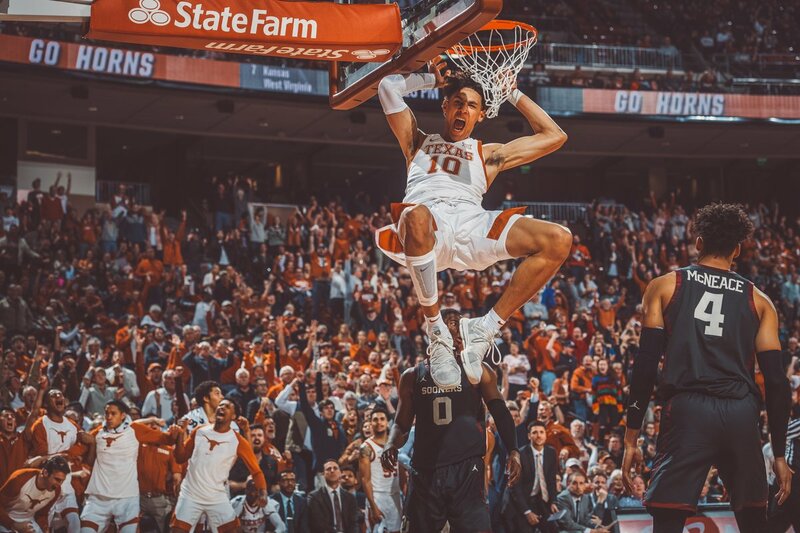 The Longhorns Men’s Basketball team topped visiting Oklahoma 75-72 at the Frank Erwin Center Saturday in front of a raucous crowd of 11,991. The veterans led the way for Texas (11-7, 3-3 in the Big 12), as senior Kerwin Roach II sparked the Longhorns to the win with 23 points while fellow senior Dylan Osetkowski added 15 points and 11 rebounds. Refining his game every time out, freshman Jaxson Hayes had 15 points and a career-high five blocks, with sophomore Matt Coleman III pitching in with 15 points in the win over the Sooners (13-5, 2-4). Jase Febres had a quiet five points in the game, but had a huge 3-pointer with 32 seconds left to put the Longhorns ahead 73-69, a lead they would not relinquish the rest of the way. Oklahoma shot just 27-for-61 in the game with the Texas defense locking down and playing the type of game they’ve talked about all season long. With the win the Longhorns moved to .500 in Big 12 Conference play while sending No. 20 Oklahoma to two-games below that mark in the conference. The ‘Horns led 29-24 at halftime but saw OU come back after the break to take a small lead halfway into the second half. From there the lead changed hands several times all the way to the final minutes. Texas plays next at TCU on Wednesday at 6 p.m.